This selection of online fact sheets concerned with plant diseases was compiled by Professor Gary W. Moorman, a Professor of Plant Pathology at Penn State. 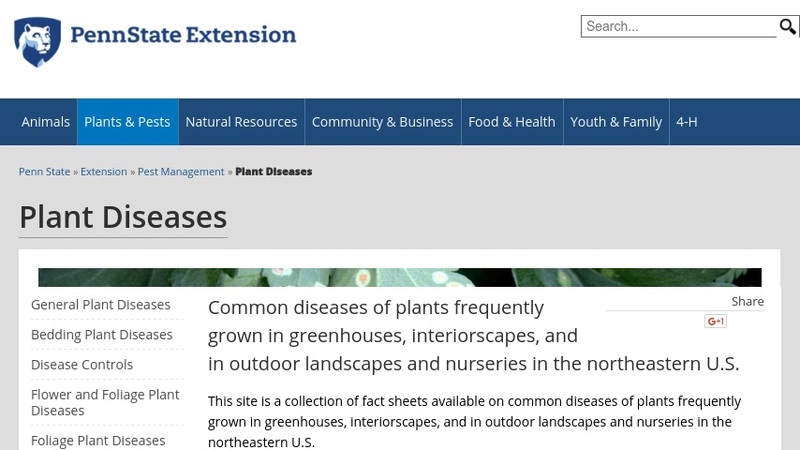 The concise fact sheets address "common diseases of plants frequently grown in greenhouses, interiorscapes, and in outdoor landscapes and nurseries in the northeastern U.S." The sheets are organized under categories for Woody Ornamental, and Floral and Foliage Plants, as well as a General Information category. Factsheets address such diseases as Bacterial Leaf Scorch, Pythium Root Rot, Botrytis Blight, Rhizoctonia, and more. There are sheets for a wide variety of plants and trees including Iris, Tulip, Maple, and Oak, to name a few.